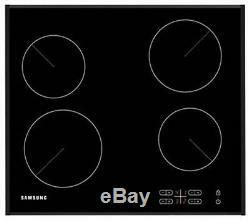 SAMSUNG C61R2AEE Electric Ceramic Hob Black. Kitchen Appliances > Built-in Appliances > Built-in Electric hobs. Brand new & pristine product. The black Samsung C61R2AEE Ceramic Hob features four burners which will let you know exactly when the hob is hot so there's no need to worry about accidental burns. Plenty of cooking space With differing sizes, whether you're cooking for yourself or for the entire family, with the Samsung C61R2AEE Ceramic Hob you can use the required heating space so there's no need to worry about wasting energy. Complete with flat ceramic surface, the Samsung C61R2AEE Ceramic Hob is easy to clean and would look good in almost any kitchen. All Currys/PC World Outlet guarantees are non-transferable. Controls: Front located touch controls. Dimensions: H:49mm W: 575mm D:505mm. Safety features: Residual heat indicators. Dimensions: 52.6 x 575 x 505 mm (H x W x D). Recess dimensions: 560 x 490 mm (W x D). 560 x 490 mm (W x D). We deliver within the UK only. We don't post to Channel Islands or Internationally. Warehouse/store pick-ups are not available. For more information, read on.. Courier selection is standard and will depend upon value and/or weight/dimensions of the product. Express: DPD - for safe, secure, signed-for deliveries to your door. This includes Northern Ireland and the Isle of Man. We do not accept orders to PO Box addresses and International orders, including those from the Republic of Ireland, the Scottish Highlands and the Channel Islands. Orders for large domestic appliances are accepted to all mainland UK addresses (including Northern Ireland) and the following islands: Isle of Skye, Isle of Sheppey, Anglesey, the Isle of Wight, and the Isle of Man. This excludes the Channel Islands and BFPO. To create your return label. Unopened - in an as new condition - unused, without installation or data input - in the same condition as supplied to you - complete with any accessories and free gifts offered with it - with the original box and unopened packaging. Unwanted products cannot be accepted after 30 days if any of the above criteria are not met. The right of cancellation does not apply in the following circumstances. When the product seal has been broken on any DVDs, CDs, memory cards or software, including games - On any personal hygiene products such as shavers, hair care products - On headphones, where the seal on the packaging is broken - If you want to return a Software Product Activation Key card which is not faulty, the silver strip on the back of the card must be fully intact as new. Complete the Reason for Return note that came with your parcel & include it in the parcel with your return. Take your parcel into any Post Office. To find your nearest Post Office. Remember to ask for a proof of return receipt from your Post Office as this will act as proof of posting should the parcel go astray. Failure to obtain this may prevent us from refunding you if your return is not received by us. Your return can be tracked using the tracking reference from your proof of return receipt by clicking Track My Return. In the same condition as supplied to you - complete with any accessories and free gifts offered with it - if possible, with the original box and packaging. The above warranties do not cover non-faulty products, nor issues caused by accident, neglect, misuse or normal wear and tear. Can a Currys or PC World retail store help? Reassuring 12 month guarantee on all products. The item "SAMSUNG C61R2AEE Electric Ceramic Hob Black" is in sale since Wednesday, May 17, 2017. This item is in the category "Home, Furniture & DIY\Appliances\Cookers, Ovens & Hobs\Hobs". The seller is "currys_pcworld" and is located in Newark. This item can be shipped to United Kingdom.